Everyone across the state of Florida and throughout many other areas in the United States has been affected by Hurricanes, floods and other extreme weather events. When severe weather hits, many home and business owners find themselves dealing with invasive floods, leaving their property and important documents soaked—often times beyond repair. And although wet papers may look useless, it doesn’t take much for a thief to gain access to your confidential information. The big issue is that although shredding is the most popular and secure way to permanently destroy documents, wet and/or moldy papers cannot be shredded using today’s machinery. But before you toss them in the trash, leaving you open to risk, read on to discover the steps to take to ensure your flood-affected paperwork is properly disposed of. Documents that are wet or even damp will jam in commercial-grade shredders so any company that tells you they can do it, is most likely going to hold on to your documents until they’ve dried out. The big problem with this is that leaving your personal papers lying around—especially in a place you can’t watch over them, means leaving yourself open to a breach. It doesn’t take much for someone who’s looking to steal identities to use a blow dryer and get their hands on social security numbers, drivers license information, bank account statements, credit card numbers and more. Your best bet is to avoid handing over your wet documents to anyone who promises to securely destroy them unless the shredding is immediate and you’re going to witness it yourself. Depending on how many documents have been impacted, you may be able to dry them out in your office or home by spreading them out on paper towels on a table top and turning them over every few hours or so. Of course, if you have boxes of files, this will be a much more arduous task. In this case, you can use fans and humidifiers to dry them out, or open doors and windows to the area (of course, making sure that it is secure). The key is, if you dry them out yourself, you can then contact a shredding service provider to destroy them onsite, so you can oversee the entire process. Besides identity theft, another concern is that your storm-damaged documents will become moldy, posing a health risk to you, your family and/or your employees. Because it takes some time for mold to grow, acting expediently is key when you’ve been impacted by a hurricane or a severe storm. If mold has developed, you’ll need to wear gloves and a mask while handling the documents and if you can, reach out to a shredding service provider that accepts documents that have mold or mildew. Cleaning up your home or office after a storm takes a lot of time and energy. And when you’ve been left with wet documents from a flood, it’s crucial to take the right steps to protect yourself and your company. 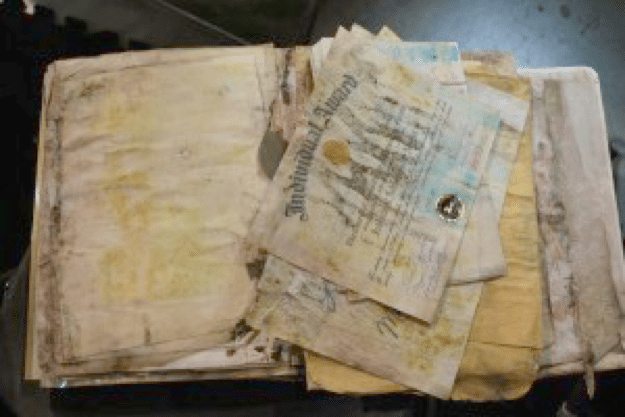 Never discard documents that contain personal or confidential information, even if they appear to be soaked and unreadable. Follow these steps and be sure to move as quickly as you can to safeguard against mold. For shredding, either at your home or office, give us a call at 772.283.4152. We offer both onsite and offsite services and will be happy to assist you in permanent destruction of your documents as well as hard drives.